The relationship between the protein concentration of lysate from amino acid (AA)/untreated and AA/insulin-treated HEK- 293T cells and the absorbance at 450 nM using PathScan® Phospho-4E-BP1 (Thr37/Thr46) Sandwich ELISA Antibody Pair #7854 is shown. HEK-293T cells were serum-starved overnight and deprived of amino acids for 1 hour. The amino acids were replenished for 1 hour. 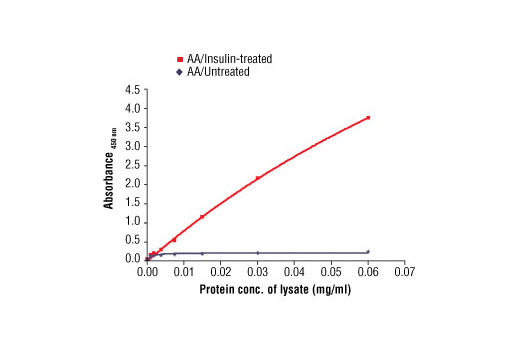 Cells were either untreated or stimulated with 100 nM insulin for 30 minutes at 37ºC. CST's PathScan® Phospho-4E-BP1 (Thr37/Thr46) Sandwich ELISA Antibody Pair is offered as an economical alternative to our PathScan® Phospho-4E-BP1 (Thr37/Thr46) Sandwich ELISA Kit #7216. Capture and Detection antibodies (100X stocks) and HRP-conjugated secondary antibody (1000X stock) are supplied. Sufficient reagents are supplied for 4 x 96 well ELISAs. The Phospho-4E-BP1 (Thr37/Thr46) Capture Antibody is coated in PBS overnight in a 96 well microplate. After blocking, cell lysates are added followed by a 4E-BP1 Detection Antibody and anti-Mouse IgG, HRP conjugated antibody. HRP substrate, TMB, is added for color development. The magnitude of the absorbance for this developed color is proportional to the quantity of Phospho-4E-BP1 (Thr37/Thr46) protein.